Royal Arrival: It's A Boy! : The Two-Way The Duchess of Cambridge, better known to most of the world as the former Kate Middleton, has given birth to a baby boy. He weighed in at 8 pounds 6 ounces and is third in line for the throne. Crowds of tourists gather on the steps of the Queen Victoria Memorial Statue outside Buckingham Palace in central London on Monday. The Duchess of Cambridge, better known to most of the world as the former Kate Middleton, has given birth to a baby boy, the crown announced in a press release. The baby was born at 4:24 p.m., London time on Monday, and weighed 8 pounds 6 ounces. The baby, whose name we still don't know, is third in line for the throne. "The Duke of Cambridge [Prince William] was present for the birth. "The Queen, The Duke of Edinburgh, The Prince of Wales, The Duchess of Cornwall, Prince Harry and members of both families have been informed and are delighted with the news. "Her Royal Highness and her child are both doing well and will remain in hospital overnight." Prince Charles said he was "overjoyed" at the arrival of his first grandchild. "Grandparenthood is a unique moment in anyone's life, as countless kind people have told me in recent months, so I am enormously proud and happy to be a grandfather for the first time and we are eagerly looking forward to seeing the baby in the near future," the Prince of Wales said in a statement. After the easel was placed in front of Buckingham Palace, a town crier came out of the hospital and read an announcement. "Hurray, hurray, hurray, there's a prince here today," the crier said. "God save the queen." The BBC reports via Twitter that the British prime minister said he was "delighted" for the Duke and Duchess. "The whole country will celebrate," David Cameron said. The BBC tweets that Prince Charles said he is "enormously proud and happy to be a grandfather for the first time ... an incredibly special moment for William and Catherine"
An easel stands in the Forecourt of Buckingham Palace to announce the birth of a baby boy, at 4:24pm to the Duke and Duchess of Cambridge at St Mary's Hospital on July 22, 2013 in London, England. "Her Royal Highness The Duchess of Cambridge was safely delivered of a son at 4:24 today. 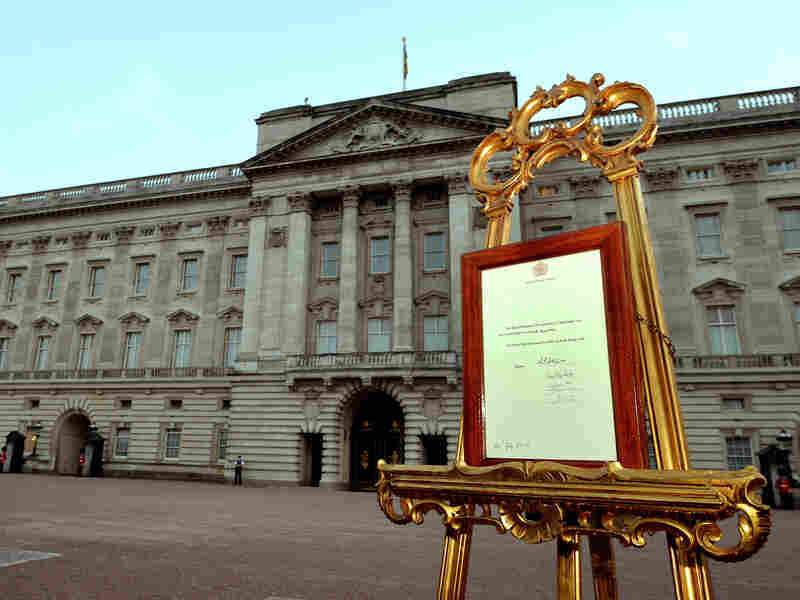 The announcement was supposed to be made through an easel in front of Buckingham Palace, but the palace made the announcement via a press release. TV images, however, show a huge crowd in front of the palace and they showed the press secretary leaving the hospital with the official announcement in hand. He is now in a car, headed to the palace, where he will place the announcement on a gilded easel. Royal watchers on CNN say in the past, it has taken weeks to reveal the name of the new heir to the throne. The Duchess of Cambridge, better known to most of of the world as the former Kate Middleton, is "in the early stages of labour" at St. Mary's Hospital in London, the royal website says. So we should hear soon whether the baby who will be third in line to the throne is a boy or a girl, and perhaps what Prince William and Kate have chosen as the tyke's name. 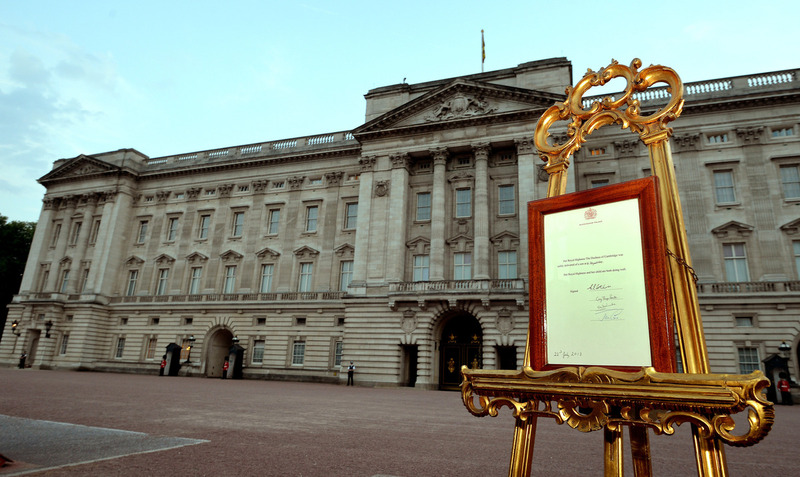 If all goes according to plan, the news will be released to the world in the form of a statement — on paper — posted on an easel set up outside Buckingham Palace. The BBC says that "the way the birth will be announced is steeped in tradition. 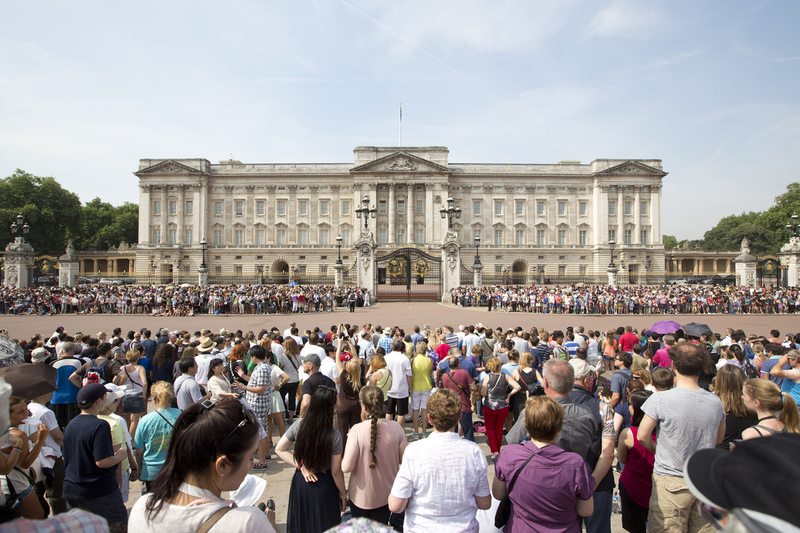 It is custom for news of royal births and deaths to be attached to the railings of Buckingham Palace." And in this case, the easel will serve as something of a substitute for the railings. "After the note is displayed, an announcement will be posted on Twitter and Facebook, and the media will be informed," the BBC adds. -- The Twitter account for Clarence House, the royal couple's home, is here. The news that Kate had been admitted to the hospital was posted at 2:37 a.m. ET (7:37 a.m. in London). -- The monarchy's Facebook page is here. We'll be watching and will post as soon as there's more news. Meanwhile, NPR's Philip Reeves writes that "for many here in London, the much-trumpeted royal baby fever is more of a summer silly season snuffle — spreading faster around the world than it is in the U.K."
-- Will 'Harry Potter' And Newest Royal Share A Birthday? On The Guardian's live blog, Janette Ratcliffe and Paul McCarthy say they hope the little girl that Ratcliffe delivered Monday ends up sharing the royal baby's birthday. "It just makes it a bit more special," says the new father. Ratcliffe says, "I did feel under pressure to hold on to her until Kate went into labour."